Filipe just sent me this on Twitter. It looks like Jeremy Honorez gets pushed into a post and his bike explodes. Watch the YouTube video. His team has posted some news about the crash, sounds like he's in rough shape. Hope he makes a full recovery. Poor taste, and incomplete. 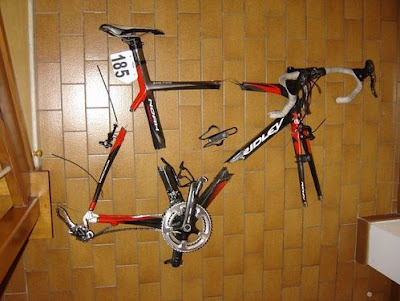 The rider sustained heavy injuries in this crash and your concern should lie with the rider and not simply highlighting his broken bike, or pretending it's something unique to carbon. "Last Wednesday, young Jérémy Honorez crashed during Memorial Rik Van Steenbergen. Jérémy, 22, a rider of our Walloon satellite team Lotto - Bodysol - PCW, has been medicated on the spot for 40 minutes prior to being transferred to the university Hospital at nearby Antwerp. The diagnosis is very heavy: open fracture of the left shinbone, open fracture of the right femur, with complications to the blood flow toward the lower leg, right knee ligament torn.. The rider has been put in an artificial coma to kill the pain. The same night, he remained seven hours in the operating theatre. We all wishes Jérémy a total and rapid recovery after his dreadful crash." I've never seen before a bike as destroyed as this without crashing a car. Anonymous @1:53pm, either this blog doesn't show or credit post edits, or you didn't really read the post before commenting. The link you post is in there already, and the tone was not at all what you suggest it to be. I don't think anybody has anything but sympathy and well wishes for Jérémy. Err..i concur, you're over-reacting 'Anonymous'. Blog has been amended originally had a link the the YouTube vid, but no mention of the rider's serious injuries. THANKS to the blog owner for addressing concern, and sorry for flaming. I'm sure no offense was intended but the omission of the injuries focused attention to the bike. New blog post is much improved... and yes, I really should lighten up on what happens to be a blog that I love!